In the last hour, I have really scored in the swag department, all thanks to Social Media. 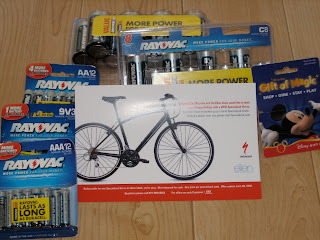 First came the Fed Ex envelope that held a HUGE surprise- I had won a bike from the Ellen Show. This was from an Earth Day contest she had. Honestly, I had forgotten all about it until I opened the envelope. Then- the doorbell rang again, and it was my Rayovac and Disney gift card swag from Disney and Rayovac. Ever wish you had Magic Wand? Have you ever wished that you had a Magic Wand? Rayovac Batteries knows that feeling- and they are doing something about it. Take a moment and think of what you and Rayovac batteries could accomplish if you had a Magic Wand. Then watch the video to the left that shows what happens when a little girl gets the chance to spread some magic around Disney World with her Magic Wand. Then, go to www.rayovac.com/disneyvacation and enter for a chance to win in the Rayovac Magic Wand Sweepstakes. The grand prize is a trip for 4 to either Disneyland Resort or Walt Disney World. And really, who doesn't want to win that??? Also, join Rayovac and MomSelect for a Twitter Event to support the exciting Rayovac Powers Your Vacation-Magic Wand Sweepstakes. The evening will feature more than 20 fun giveaways from Rayovac ranging from a summer supply of Rayovac Batteries to Disney Gift Cards. I ran last Friday with a severe head cold and I was miserable. So, I decided to take a couple of days off from running. As I went to my kickboxing classes this week, not only was I still feeling the effects of the head cold, but I noticed I was dragging during class and after class I HURT! My legs hurt more than they should after those workouts. Not that they were easy (they never are) but they weren't worse than normal. Oh, and there's the little matter of the fact I hurt my back playing with Matthew. There hasn't been much of anything exciting going on- just recovering from the Broad Street Run, trying to increase my running mileage, and lots and lots of baseball games. My family went to the Phillies afternoon game last Thursday, Matthew had a baseball game Friday night and Saturday morning, and then we went to the Reading Phillies baseball game Saturday night. Today I did two things I have never before done. The first was run (and complete) a 10 mile race. I ran in the Broad Street Run, a 10 mi race in Philly that goes from North Philly all the way to the Philadelphia Naval Yard. Today was the hottest (and most humid) day in Philly so far this year. Actually, we have set a record (or were about to) for the hottest May 2 in history. That made the race MISERABLE! It was hot, horribly hot. But, this leads to the second thing I have never done before- I ran through open city fire hydrants. Because of the heat and humidity, the city had opened the fire hydrants along the race course for us to run through... That was fun! My goal was to run the whole race and average under 10 minutes/mi. Well, I didn't make that. I ended up having to really scale back my pace to deal with the heat. I have run several races before this (up to 5 miles) and have never needed to take the water at the water stations. I took the water (and Gatorade at a few) at every station. I also purposely scaled back my pace for the last part of the race. My legs were TOAST! Miles 1-3 went pretty well, but I hit a wall about mile 4. I struggled, I mean really struggled miles 4-7. Once I hit mile 7, it was better. Not great, but better. Overall, my time was 1:48:38. My pace came in at just under 11 min/mi. Out of the 30,00+ people that entered the race, 25,594 finished. I came in at 17,293 (and 8,345 out of 14,149 females). I am quite happy with how I did. I like to think that my time would have been better in nicer weather, but-- I did the 10 miles and finished.